The Best Bass Guitars for Beginners in 2019: reviewed and rated here! It can be hard to choose the best bass guitar for beginners, what with so many options out there. But finding the best starter bass shouldn’t have to take forever, which is why we’re stepping in and lending beginners a hand. On this page, we’ve listed some of the most noteworthy bass guitar models that would suit new bass players perfectly. We’re also tailoring our reviews for beginners looking for their first bass. Intermediate, advanced and even pro-level bassists are of course welcome to browse around as well. Who knows, you may find your next axe right here. Groove on! Fender Mustang PJ Pau Ferro Electric Bass Guitar The Fender Mustang Bass PJ features Fender’s P Bass and J Bass pickups and a three-way toggle pickup switch for a remarkable versatility in tone. A short scale length of 30 inches, together with a comfortable and fast-playing maple neck, makes this bass beginner-friendly. The Mustang Bass also features a small and lightweight alder body and a pau ferro fingerboard. Hofner Violin Electric Bass Guitar The Hofner Violin Bass achieved worldwide fame as Paul McCartney’s favored instrument. This cultural icon is instantly recognizable for its violin-shaped hollow body. 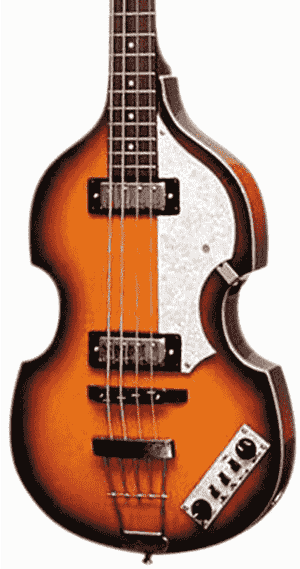 The Hofner Ignition Violin Bass closely takes after McCartney’s, and it simply oozes with that vintage vibe. The small, lightweight body and the short scale length make it extremely easy to play for beginners of all ages. 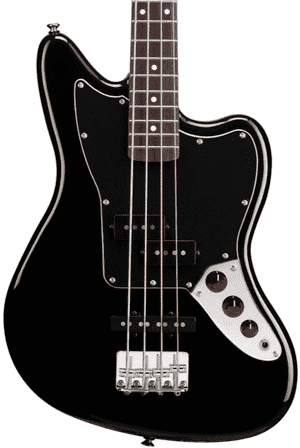 Squier Vintage Modified Jaguar Special SS Electric Bass Guitar Squier’s modern and more affordable take on the Fender Jaguar Bass is something beginners would surely love. The Squier Vintage Modified Jaguar Bass Special SS boasts a short scale (that’s where the ‘SS’ comes from) and a sleek agathis body with an offset waist. Like the Fender Mustang Bass, it also has a P Bass and a J Bass pickup. Squier Vintage Modified ’70s Jazz Electric Bass Guitar Time to jazz it up! The Squier Vintage Modified Jazz Bass '70s sports a maple body with a pair of Fender-designed Jazz Bass pickups for that warm, punchy tone that’s perfect not only for jazz but also a variety of other music styles. The controls are straightforward and easy to use so beginners can focus on their playing. Ibanez SR505 Electric Bass Guitar If you’d like to try a 5-string bass, the Ibanez SR505 is something that’s definitely worthy of consideration. It’s got a fast-playing SR5 neck that’s thinner and has a narrower nut than most traditional basses, letting you play at a fast speed. The contour of the SR505 body is also sleek and lightweight for a comfortable playing experience. Squier Affinity Precision Bass PJ Electric Bass Guitar A list of the best bass guitars for beginners would be incomplete without the Precision Bass. The beginner budget-friendly version of this iconic bass is the Squier Affinity Precision Bass PJ Bass, AKA the Squier P Bass. 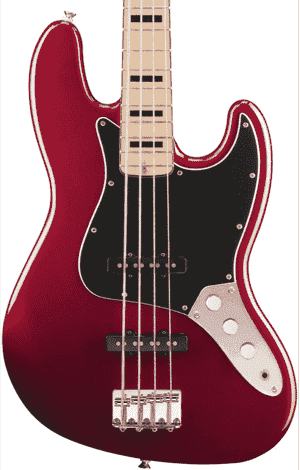 The P Bass has that much-desired classic Precision Bass looks, tone and feel. Go ahead and practice as long as you want! Yamaha TRBX304 Electric Bass Guitar The Yamaha TRBX304 is a versatile bass that boasts superior performance for its price. It offers beginners a comfortable body shape and a smooth and fast-playing 5-piece laminated maple and mahogany neck as well as a rosewood fingerboard. This bass is equipped with the Yamaha Performance EQ active circuit so you can define and shape your tone with ease. Ibanez Mikro Electric Bass Guitar The Ibanez Mikro Bass is another fantastic guitar for beginners, especially kids, teens and adults with small hands. The Ibanez GSRM20 Mikro Bass is a 3/4 size electric bass guitar that has a short scale length of just 28.6 inches. It may be a Mikro, but it delivers a full-scale sound and a massive appeal. 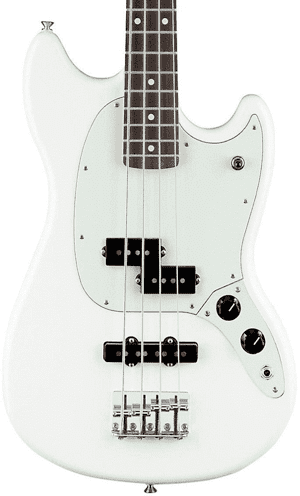 The Fender Mustang PJ Bass has plenty to offer novice players and seasoned musicians alike. This Fender bass model has been around since 1964 and receives updates every now and then to cater to modern tastes and higher player standards. One of the updates the Fender Mustang PJ Bass has received is the combination of time-tested P Bass and J Bass pickups that you’ll find at the neck and bridge, hence the name. Players can toggle between the vintage-style Jazz Bass pickup (single-coil) at the bridge and the vintage-style split single-coil Precision Bass pickup at the neck via the 3-position toggle. Onboard controls also include controls for master volume and master tone. The Mustang PJ Bass features an alder body that is smaller and lighter than most bass guitar bodies and a short 30-inch scale, making it an ideal instrument for young players and adult beginners with a slight build. The shorter scale has a lower string tension as well, providing a more comfortable and looser playing feel that would make learning to play all the more easier. Other features include a C-shaped maple neck, a pau ferro fingerboard, a vintage-style Fender tuning machines and a hard-tail four-saddle bridge. Even if you’re not a Beatles fan (gasp! ), you may probably recognize the Hofner Violin Bass as the “Beatles bass” or “the bass that Paul McCartney plays.” This guitar was initially designed for players of the upright bass (AKA the double bass) who want to have a more compact instrument to use when playing in jazz and beat bands. The Violin Bass was also constructed in a way familiar to Hofner workers, who had been crafting violins for many years. The new Hofner Ignition Violin Bass is modeled closely after McCartney’s bass. This semi-hollow bass has a spruce top and flame maple back and sides, providing lots of natural acoustic resonance. It also sports some very nice vintage appointments, including white binding on the top, back and sides as well as a pearloid pickguard and a beautifully done violin sunburst finish. The Hofner Ignition Violin Bass boasts two Hofner Ignition Staple Nickel humbuckers at the neck and bridge, each with its own volume control. The neck is made of maple and it’s topped with a rosewood fingerboard with 22 frets and dot inlays. The scale length measures 30 inches, allowing beginners and small bass players to fret chords with ease. Fender makes some of the best basses in the world but these don’t often come at a beginner-friendly price. Good thing there’s the Squier by Fender brand to get Fender-quality guitars from without the typical Fender price. The Squier Vintage Modified Jaguar Bass Special SS is one such guitar that will surely impress but won’t break the bank. The ‘SS’ in the name stands for short scale – yes, this model has a 30-inch neck designed to make playing easier for beginners and players with small hands. The slim maple neck is also carved into a C-shape for maximum playing comfort, making fast runs effortless. The neck is also topped with a smooth-playing rosewood fingerboard with 20 medium jumbo frets. The Vintage Modified Jaguar Bass Special SS by Squier has an agathis body with a gloss urethane finish for a nice sleek look and feel. It’s fitted with a split single-coil Precision Bass pickup at the middle position and a Jazz Bass single-coil pickup at the bridge. And while there are no controls for pickup switching, you can adjust the volume of the pickups individually. There’s also a master tone control so you can shape your sound as you see fit. The Seventies was a classic decade in the history of the Fender Jazz Bass, and Squier brings it back with its Vintage Modified ’70s Jazz Bass. You’ll get the authentic ‘70s Jazz Bass sound thanks to the dual Fender-designed single-coil Jazz Bass pickups. You’ll also have a more enjoyable and comfortable time practicing because of the slim C-shaped neck, which fits snugly in the hand and makes it easier to play fast. The body of the Squier Vintage Modified ’70s Jazz Bass is made of soft maple and has a polyurethane finish, providing a warm sound with just the right brightness to please the ears. The neck and fingerboard are also made of maple. The fretboard, with its 20 medium jumbo frets, features black binding and black block position inlays for that elegant, vintage look. There are three controls for the electronics. A volume control knob for the middle pickup, another for the bridge pickup and a master tone control. The Squier Vintage Modified ’70s Jazz Bass has a 34-inch scale length, making this model a good option for adult beginners. Other notable features include standard open-gear tuning machines, a three-ply black pickguard and a four-saddle standard bridge. Can beginners get started on a five-string bass? Of course! The Ibanez SR505 is a beginner-friendly 5-string bass that features a lightweight body, a smooth and fast neck and the electronics to match. If a five-string bass is your instrument of choice, this model is the best bass guitar for beginners like you. The SR505 5-string bass by Ibanez has a five-piece jatoba and walnut neck that’s thin yet surprisingly sturdy and stable. It’s topped with a jatoba fingerboard with abalone oval inlays and medium frets. The fretboard has a dark, reddish-brown color and produces a richly textured mid range and a crisp and clear high end. This bass has a mahogany body for a rich and warm focused sound. It also has an extended neck joint, which makes it easier for beginners to access the higher frets. The neck tongue also gives the SR505 a unique look. The Ibanez SR505 is equipped with Bartolini MK1 pickups at the neck and bridge, providing a wide frequency range as well as enhanced definition for optimum tonal accuracy. Tone-shaping controls are provided by the Bartolini MK1 3-band EQ with a three-way mid-frequency switch. First there’s the Jaguar, then the Jazz and now we have the P Bass. The Fender Precision Bass is one of the most well-loved guitars, and if you can get started on one, do so! Squier offers beginners the opportunity to have their own P Bass without spending too much on their first bass. Say hello to the Squier Precision Bass PJ, which as you may have guessed is equipped with both Precision Bass and Jazz Bass pickups. The pickup combo makes the Squier P Bass an extremely versatile player with plenty of tonal options to offer. 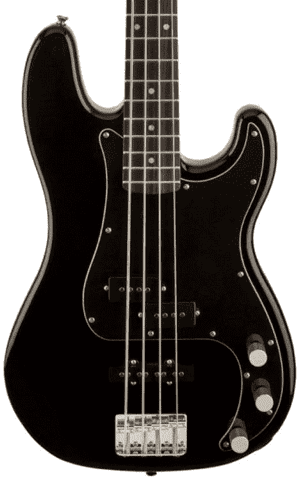 The Squier P Bass has an alder body and a maple neck. The neck is topped with an Indian laurel fingerboard with 20 medium jumbo frets and dot inlays. The neck has a C-shaped profile, making it comfortable to hold. For beginners just learning to fret notes and practicing scales, this is a big deal because it means you will not feel fatigued easily through hours of practice. The Squier Affinity Series Precision Bass has the PJ pickup configuration where you have a P Bass pickup at the middle position and a J Bass pickup at the bridge. Part of the TRBX300 Series, the Yamaha TRBX304 is a beginner-friendly bass guitar that delivers a pro-level performance. With the TRBX304, Yamaha offers players a perfectly balanced guitar physically and tonally. The mahogany body is engineered to distribute the guitar’s weight evenly, providing maximum comfort, while the electronic system features Yamaha’s own Performance EQ active circuitry, which gives you access to stage-ready tones and lets you shape your sound easily. The Yamaha TRBX304 has a five-piece laminated maple and mahogany neck for durability and stability, in addition to a great tone. This bass guitar is fitted with YGD-designed M3 pickups that deliver a powerful and clear tone with impressive depth. It has a hum-canceling design, ensuring that your playing is as clean and free from noise as possible. The TRBX304 also features the Yamaha-exclusive Performance EQ active circuitry, which has five full spectrum EQ curves including pick, slap and solo – all the sounds you’ll need to deliver a powerful performance. You also get a 2-band master EQ control for tone shaping. It all sounds complex, but the Performance EQ active circuit is actually so easy to use, you’ll spend hours experimenting with different settings for different songs and playing styles. This Mikro bass has a major appeal! The Ibanez GSRM20 Mikro Bass is a small instrument you can get at a small price, but what you get in return is massive. First, you get a compact and lightweight body made of mahogany. Next, you have a GSRM4 maple neck topped with a rosewood fingerboard with pearl dot inlays. The winning element that makes the Ibanez Mikro Bass one of the best bass guitars for beginners is its short scale length of just 28.6 inches, which is just perfect for players with smaller hands. The string tension is also lower on a short-scale bass so it means you’ll have an easier time playing. Even if you don’t have small hands, the short scale makes it easier for you to make quick bass runs. 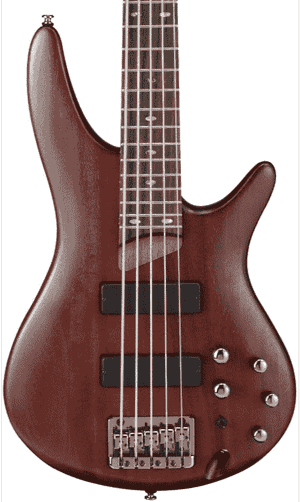 The Ibanez GSRM20 Mikro Bass is equipped with a P-style middle pickup as well as a J-style bridge pickup. The pickups are controlled by standard bridge pickup volume, neck pickup volume and tone knobs. The pickups respond well to various settings, delivering lots of versatility in a neat little package. 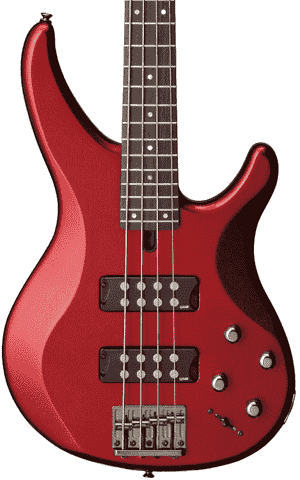 The Ibanez Mikro Bass is awesome for beginners and players of all skill levels. Today’s budding bass players are fortunate to have a slew of fantastic electric bass guitar models to choose from. Not just any bass guitar would do however – the bass you choose should have features that make it beginner-friendly. In our reviews above, we’ve highlighted some of the top features that make these guitars suitable for beginners. Electric guitars are heavier than acoustic guitars, and the bass is no different. Holding a heavy axe can tire you quickly, so it’s important that the guitar you choose is of a size, shape and weight you find comfortable. How do you determine this? It’s advisable to visit music stores and just get a feel of different bass guitars if possible. If not, research the specs and read reviews to see how others find the guitar’s weight. 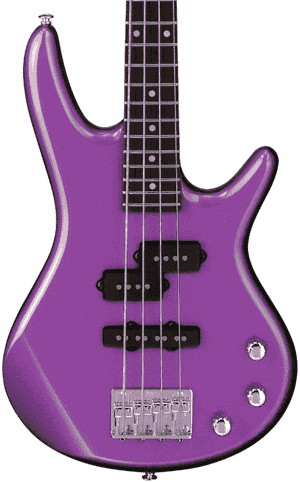 In general, smaller bass guitars and hollow-body guitars tend to be lighter than standard solid-body basses. Some electric bass guitars such as the Yamaha TRBX304 are also designed to distribute the guitar’s weight evenly for player comfort. You also need to consider how the neck feels in your fretting hand. A well-contoured neck can ease the way to a more enjoyable playing experience, especially when you’re first learning to fret chords and run scales. As with the body, it would be great if you can try out different necks to see which bass models offer a good fit and a smooth playing feel. The closer the strings are to the fretboard (without making any sort of fret buzz), the easier these are to hold down. Some bass guitars come with a low string action out of the box, but expect entry-level models to require a proper setup to bring the action down to a more comfortable height. Smaller bass guitars with shorter necks typically have a short scale as well. A short scale means the length of the strings from the nut to the saddle are shorter than standard, which is 34 inches in length. Short-scale bass guitars like the Fender Mustang Bass, Squier Jaguar Bass, Ibanez Mikro Bass and Hofner Violin Bass are easier to play for beginners and players with small hands or short fingers. They also have a lower string tension, which means the strings require less pressure to push down on the fretboard. It’s important for beginners to be able to focus on improving their playing technique instead of figuring out knobs and switches, so the easier the electronics are to use, the better. One thing that can easily discourage aspiring bassists from playing is a default muddy sound that comes from their guitar. The sound of the bass depends on many factors, from the wood used in the body and the neck and the kind of strings installed, to the quality of the pickups and other electronic components. These should all work to deliver a rich bass sound that would provide a good foundation for tone-shaping. A starter guitar, no matter how inexpensive, should still be of a sturdy construction. It should have solidly built body, a stable neck and parts that don’t fall off after just a few hours of play. The quality of the build spells the difference between a bass guitar that will end up as kindling and an instrument that will serve you well for years, even after you’ve passed the beginner phase and acquired other guitars. Yes, physical appeal is important when choosing your first bass guitar. As a learning instrument it should be something you actually like in terms of looks, because if it looks “meh” to you there’s a good chance you may not feel the urge to pick it up and practice. So, choose a bass guitar that you find absolutely stunning, something that you wouldn’t want to put down. The last feature is often the most important for many people who intend to pick up the bass guitar. Your budget would often dictate your purchases, and a good bass guitar is no small investment. The bass guitar models we’ve listed here vary in price but all are within the range of what most consider to be beginner-friendly. As a beginner, you wouldn’t want to buy a too-cheap guitar that could be of low quality, and you wouldn’t want to spend too much either until you’ve developed a taste for a particular sound, which a more expensive guitar can offer. The bass guitars on this page all offer incredible value for the price they’re going for so you can rest assured you’re getting more than your money’s worth. So take your pick according to your needs and preferences and start playing that bass!